A day after the release of eight human rights activists by an İstanbul court, a court in Izmir ruled for the continuation of the pre-trial detention of Taner Kılıç, chair of the board of Amnesty International’s Turkey section, combining his case with the activists’ Büyükada case. “In defiance of justice and logic, the İzmir court decides to transfer Taner Kılıç to the Büyükada case and continue his pre-trial detention,” Andrew Gardner, senior advisor and researcher on Turkey for Amnesty International, tweeted on Thursday. Kılıç, a lawyer, a founding member of AI Turkey and chairman of its board of directors since 2014, was arrested by an İzmir court on June 9 as part of an investigation into the Gülen movement. 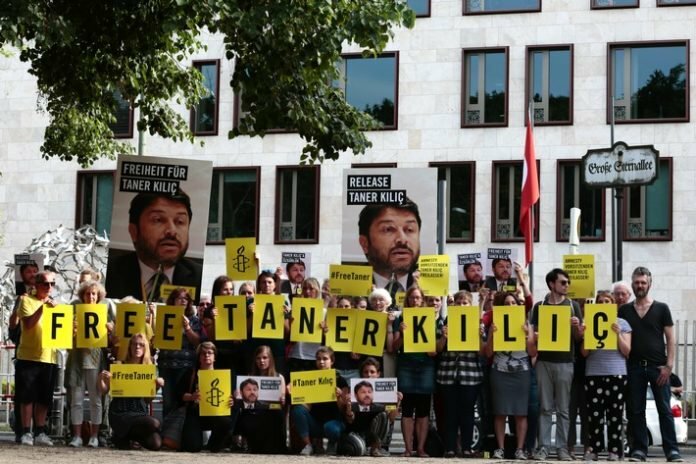 “Extremely disappointing that court ruled to keep Amnesty Turkey chair Taner Kilic in jail & a blow after good news of #Istanbul10’s release,” said Emma Sinclair-Webb, Human Rights Watch (HRW) Turkey director, in a tweet on Thursday. “The release of the Istanbul 10 late last night restored some faith in Turkey’s justice system. Today, that faith has been washed away. Turkish authorities have repeatedly and publicly presumed Taner Kılıç’s guilt, on the basis of innuendo and unsupported allegations,” added Shetty. Eight human rights activists, including Amnesty International’s Turkey chief Idil Eser, were released by an Istanbul court on Wednesday evening. On July 5 Turkish police, acting on an anonymous tip, raided a hotel on Büyükada, one of the Princes’ Islands off İstanbul, and detained Eser from AI, İlknur Üstün from the Women’s Coalition, lawyer Günal Kurşun from the Human Rights Agenda Association, lawyer Nalan Erkem from the Citizens Assembly, Nejat Taştan from the Equal Rights Watch Association, Özlem Dalkıran from the Citizens’ Assembly, lawyer Şeyhmus Özbekli, Veli Acu from the Human Rights Agenda Association and two foreign trainers, Ali Garawi and Peter Steudtner. The pro-Erdoğan Star daily claimed on July 11 that the CIA and MI6 were behind the meeting. Another pro-Erdoğan paper, Yeni Şafak, on July 23 claimed that the rights activists had ties to the German BND intelligence service. During a press conference in Hamburg on July 8, President Erdoğan accused the detained human rights defenders of plotting a follow-up to the July 15, 2016 coup attempt and signaled that the detention of the rights defenders could turn into imprisonment. This article originally appeared in Turkish Minute on Oct 26.